Old files and boxes emptied into the bin….check. New files labelled up for the new cohorts…check. Tool cupboard organised neatly for the first time in months, teacher’s desk cleared and the piles of half marked past papers, revision sheets and assessments finally put away. Even that burgeoning pile of part cut acrylics sheets have been moved away from their resting place at the side of the laser cutter. It can only mean one thing; it’s the end of the summer term. I interrupt my planned creative manifesto (muhahaha) with a blog that doesn’t aim to be contentious or thought provoking but simply takes a moment to celebrate the day that all teachers look forward to, the one that makes the long slog of the previous year seem worthwhile; the start of the long summer holidays. However, I do find that teachers fall into one of two camps; those that love the long summer and make the most of every minute of freedom and those with kids…nowadays I am, or rather was, most definitely the former. Logistics of keeping the family amused aside, the seemingly infinite summer term which is now behind you is matched only by the long, dark and cold autumn term for feeling like it will never end. You have no doubt had to suffer at least a few days of blistering heat this term in between the bouts of monsoon like weather but all in all it can feel like an anticlimax after the months of hard work leading up to the controlled assessment deadlines, then exam preparation followed by the lottery of the moderator visit. One by one the groups left for study leave or after their exams leaving your KS3 groups counting the days to the summer or Year 12 begrudgingly starting their A2 work. 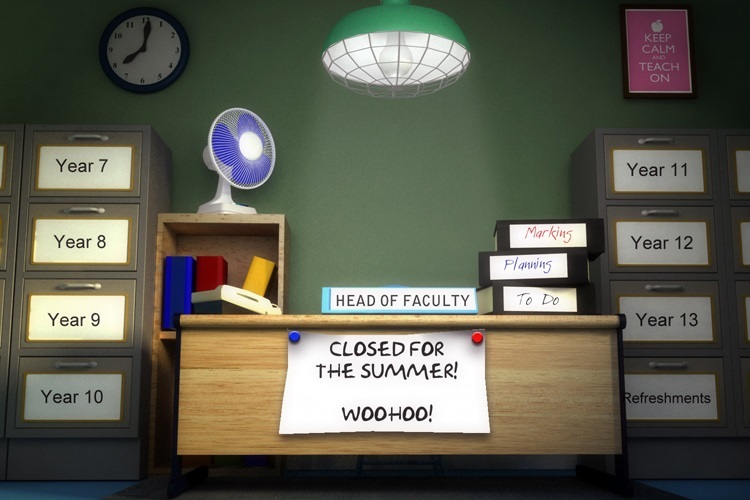 But all that is behind you now and you have six weeks of summer to enjoy, free from marking, planning or teaching. Maybe for some, but for many of you thoughts will already have turned to the subject reforms which will be taught from 2017 and these may begin to pervade your every thought now you actually have time to think about it. Perhaps you are still wondering how to meet all the new NC targets in the two year KS3 your school offers or how you are going to merge all the subject specialisms in your school into the one single subject title from next year. You are no doubt still thinking of the pending GCSE and A-level results and these will play on your mind until they are released in August. Given the current state of education you might even be worrying about just what lies in store for you when you return in September presuming you are going back at all, in which case I am sure you have plenty on your mind. You may be unfortunate enough to have more work to do at school which will take up the first few weeks of your summer holiday. Those lie in’s you were looking forward to won’t really happen for weeks as you continue to wake at 6.30am convinced you are late for work and let’s not forget how your muscle memory kicks in during August when you realise you really ought to start planning for the Autumn term. Realistically then, your summer might be just a few weeks genuine rest and relaxation at best; something I was always trying to point out to my friends who constantly complained about the excessive number of holidays they jealously accused me of having. Sadly, we all know that the summer is only a long break if you have nothing to do and for the most of us, it’s simply a little extra breathing space to prepare for next term! For those fortunate enough to find themselves with the whole summer break to enjoy, do spare a thought for yours truly as I am putting my money where my mouth is (educationally speaking) and spending what should have been a lovely extended school holiday working in industry as I hone my process and CNC skills on the production floor and brush up on my Solidworks skills in the design office. We shall have to wait and see if the experience will be enough to tempt me away from the classroom permanently but so far the return to industry has been a real eye opener. However, I will share the gory details in a future blog and avoid revealing anymore as I don’t want to ruin that ‘happy feeling’ you are no doubt still enjoying since you walked out of the school building for the ‘last time’ this term. If you are reading this blog on a warm July afternoon then you are crazy…why aren’t you in the nearest beer garden, doing cartwheels and planning what you can do with whatever school holiday you may have? I know I would be if I had the chance (sad face) but I have made my choice so no scope for complaining. Now, get back to that lovely glass of wine/cider/beer/spirits you have worked so hard for and enjoy the summer break you lucky people. Make the most of every day regardless of your workload safe in the knowledge that at least you don’t have to teach any classes, and don’t take those long holidays for granted like I always did! You only truly appreciate the time off when you no longer have it!